View topic - [Hacks competition 2019] Mr Robot by Revo, tibone, Calindro - Forums - SMS Power! Mr Robot is a demo of maybe the next game of RETICA (Revo, tibone, Calindro). Made with KiddEd. 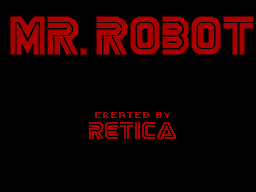 Obviously the game has nothing to do with the branding on the title screen, which is probably for the best (a faithful Mr Robot game would be quite weird). The retro styling is nice, the screens are nicely varied but I think the difficulty is a little too high - the Alex Kidd is quite punishing for precise platforming. I have to say that I love this game, rally nice!!! Very nice. 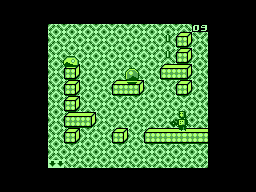 It reminds me (in a good way) of early british platform games (Manic Miner, etc.) both in looks and in how unforgiving it is. Unless there's a joke that I don't get, I don't really understand the zone's names, though. With the exception of the Gameboy zone, they look nothing like the computers they're supposed to be linked to. Especially C64 and Spectrum Zone are weird in that way. 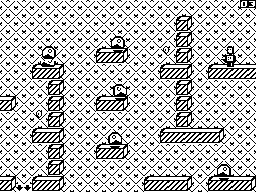 In fact, Apple zone looks much more like a typical Spectrum game. I figured as much. They don‘t really imitate the system‘s restrictions, though. C64 would have rectangular pixels and more shared colours across tiles and sprites, Spectrum would have specific combinations of 2 colours per tile (and plenty of attribute clash, but that would be impossible to reproduce). I‘m not too familiar with Apple II graphics, but what I connect most strongly with the machine are visuals with stark black and white accentuated by stray orange and blue pixels. What I‘m trying to say is that I can see the general direction, but apart from GB I feel that the things that make each machine‘s graphics uniquely recognizable are missing. Palette and resolution. I didn't work a lot on ZX Spectrum and C64 zones but I'm really satisfied with the others zone. I think 2x1 pixels would make the C64 zone graphics more different. Reminds me a bit of Teddy Boy! Nice entry! Very nostalgic feel with the black n' white palette :) My only suggestion would be a continue scheme only because my co-ordination is bad and I had to start again from the beginning a lot. Still - great job!